The models are indeed "far from perfect" since the models in fact predicted Antarctic sea ice would decrease, not increase. A few climate scientists have admitted the record high Antarctic ice levels have had the effect of "limiting confidence in [the models'] predictions," yet none have admitted that the models predicted the opposite of an Antarctic sea ice increase, that the models falsely predicted Antarctic sea ice would decline more than Arctic sea ice, and that Antarctica would warm faster than the Arctic, all falsehoods. failing to mention climate models and climate scientists did not expect the 18+ year "pause" of global warming, the record high Antarctic sea ice levels, or the recent recovery in Arctic sea ice. In fact, the global sea ice annual minima have increased about 76% during 2013-2014 from the minima of 2007-2012, and the 2013-2014 mean global sea ice has been above the mean of the satellite era. Sea ice surrounding the Antarctic continent reached its maximum extent on September 22 at 20.11 million square kilometers (7.76 million square miles). This is 1.54 million square kilometers (595,000 square miles) above the 1981 to 2010 average extent, which is nearly four standard deviations above average. Antarctic sea ice averaged 20.0 million square kilometers (7.72 million square miles) for the month of September. 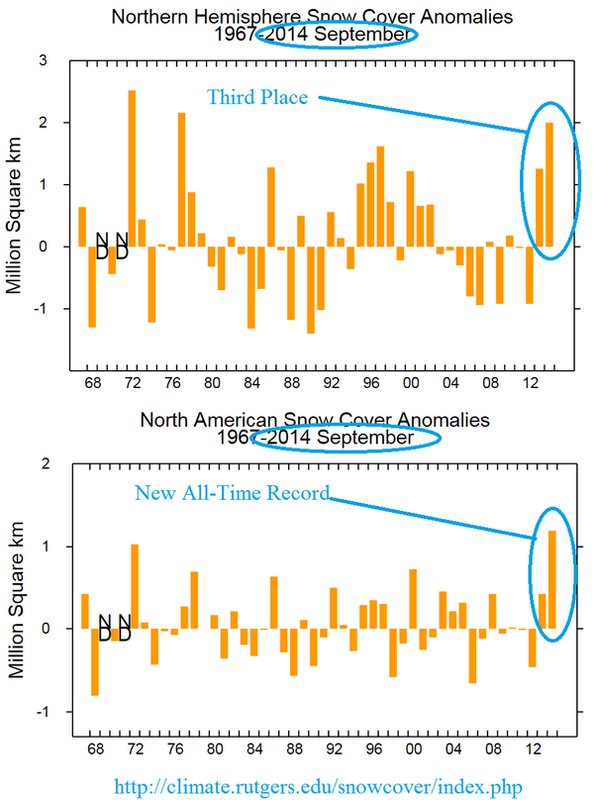 This new record extent follows consecutive record winter maximum extents in 2012 and 2013. The reasons for this recent rapid growth are not clear. 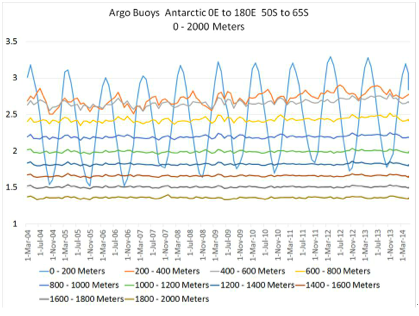 Sea ice in Antarctica has remained at satellite-era record high daily levels for most of 2014. In addition, few climate scientists seem to be aware of the unalarming bipolar seesaw theory of climate, which aptly explains why sea ice changes in the Arctic and Antarctic are normally out of phase. Most recently the record breaking sea ice in the Antarctic has been in the news. It’s a real slap in the kisser for all the alarmists; how can the planet be burning to a crisp when we’ve got more ice than we can ever use in our Scotch? But credit where credit is due, the alarmists have come up with a new paper which proves all that sea ice is due to AGW. That’s right! More ice is firm evidence of more warming. The paper is by Bintanja et al and is in Nature, where else? Bintanja et al’s theory is that melting of the Antarctic Sheet ice [ice on land] at its base, basal, is happening and this basal melt-water is flowing into the ocean trapping hot water underneath creating an inversion whereby the trapped colder surface water freezes which gives the erroneous impression that things are colder whereas it is AGW heating which sets the whole damn thing off. It’s a pity for Bintanja that another paper shows that instead of basal melting there is basal freezing. In fact Bell et al conclude this basal freezing is expanding the Antarctic ice sheet. Who are we going to believe: the guys who show that it’s the cold which causes more ice in the Antarctic or the other ones who reckon the extra ice is because it’s getting warmer? In addition, the North American snow cover anomalies just hit an all-time record, the the Northern Hemisphere snow cover is at the 3rd highest recorded levels [graphics from Chris Beal on twitter]. No doubt the climate apologists will find a way to also blame this on man-made CO2 overheating the planet. The world’s best 50 models were run and 95% of them have Antarctic sea ice decreasing over the past 30 years. 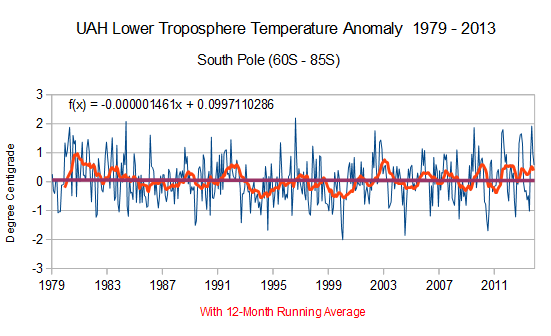 Instead, Antarctic ice over those 30 years increased to levels never before measured by satellites. Both quotes are in the same story. Truly, global warming is a faith-based theory you can never destroy with mere facts. According to NOAA, global sea ice has now been sitting above the 1981-2010 mean for 11 of the last 13 months. 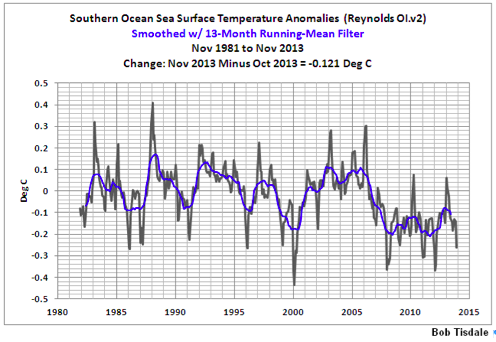 From October 2013 to October 2014, only February and July (2014) fell below the 30-year mean for global sea ice. There has been more sea ice on the globe in the last 13 months than there was for the average in 1986, when CO2 levels were about 55 ppm lower than they are now. "When combining the Northern Hemisphere and Southern Hemisphere sea ice extents, the globally-averaged sea ice extent during October was 27.26 million square km (10.53 million square miles), 0.07 percent above the 1981-2010 average and the 15th smallest (22nd largest) October global sea ice extent on record." "When combining the Northern and Southern Hemisphere sea ice extents, the globally-averaged sea ice extent during April was 23.14 million square km (8.93 million square miles), 4.5 percent above the 1981-2010 average and the third largest April global sea ice extent on record, behind 1979 and 1982." "When combining the Northern Hemisphere and Southern Hemisphere sea ice extents, the globally-averaged sea ice extent during January was 20.44 million square km (7.89 million square miles), 3.8 percent above the 1981-2010 average and the seventh largest January global sea ice extent on record."